A dynamic and engaging course with relevant, authentic texts accompanied by creative activities. 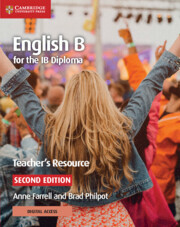 With schemes of work and teaching notes for each unit of the coursebook, this book supports busy teachers to deliver any IB Language B course. 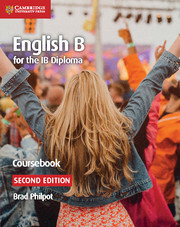 Designed to save you planning time, the book helps you incorporate all elements of the IB curriculum – such as the extended essay – into your language acquisition classes. It also includes references to the Learner Profile, Concepts, reflection and Approaches to Teaching to help you integrate these into your teaching. Includes answers to the questions in the coursebook, making it easy for you to mark. Syllabus & Assessment: Provides you with an overview of the revised guide, an outline of your role in assessment and includes the official IB revised assessment criteria. Unit Planning: Contains schemes of work to help you plan and teach each unit of the coursebook - including guiding questions and learning objectives for the unit. Lesson Planning: Includes suggestions for grouping activities into lesson plans and homework assignments. Activity Planning: Teaching notes for each activity provide you with additional ideas, plus warm up exercises and differentiation ideas. IB Curriculum: Indicates opportunities to link to the Extended Essay (EE), Learner Profile (LP), Concepts and Approaches to Teaching and Learning (ATL). Resources: Provides useful advice on using online video for skills development, plus additional suggested online resources. Answers: Contains full answers to all activities with indicative responses for more open tasks. Audio: Includes all audio and transcripts from the listening section in each unit, as well as the audio for the mock Paper 2: receptive skills - listening at SL and HL – in Section 3 of the coursebook. Literature: Contains a recommended literature list and tips for integrating literature into your English B classroom. Glossary: Provides key terms in the Word Bank features at the start of each unit of the coursebook, including a full definition and page reference for every term.